A cheque for £2,000 was presented to Laura Irwin of Action Mental Health. 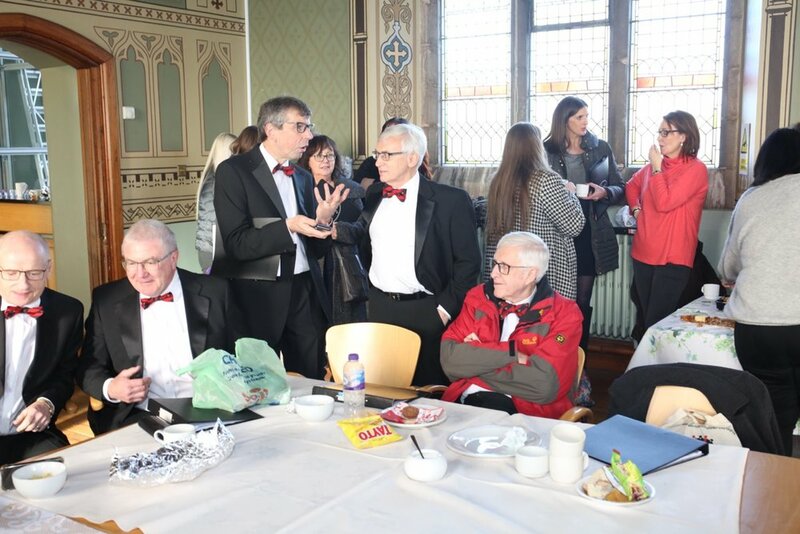 The money was raised at a charity concert in The Great Hall, Stormont, on 22nd March 2019. 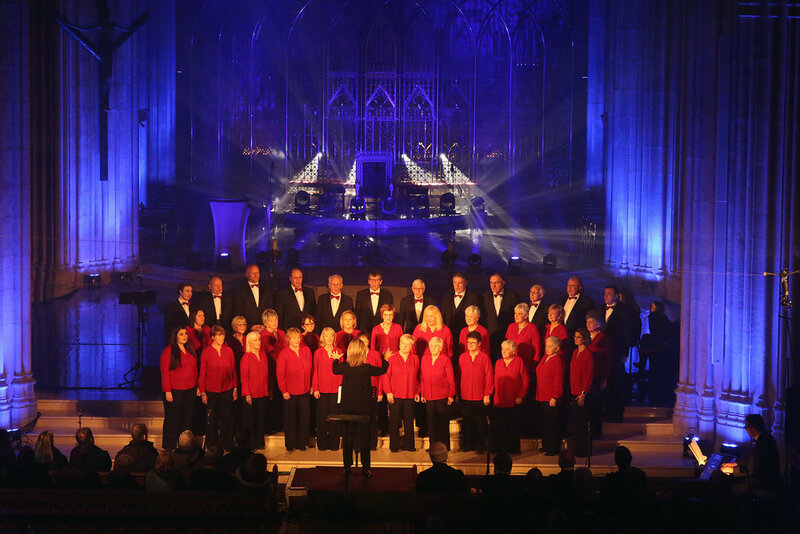 The choir returned to the Great Hall in Parliament Buildings for the second year as it held a charity concert in aid of Action Mental Health. 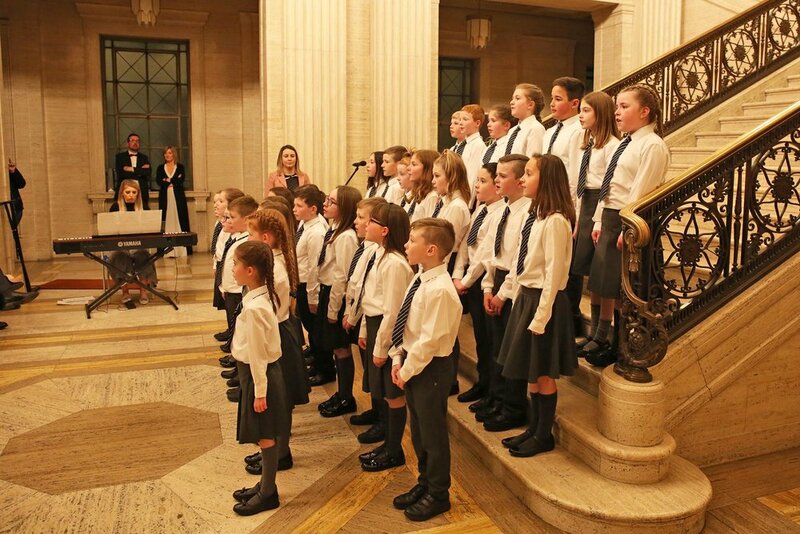 Joining the choir were the young people of Kilbride Central Primary School, together with flautists and singers from Ballyclare High School and Irish dancers from the Ian Mackay School of Irish Dancing join Templepatrick. 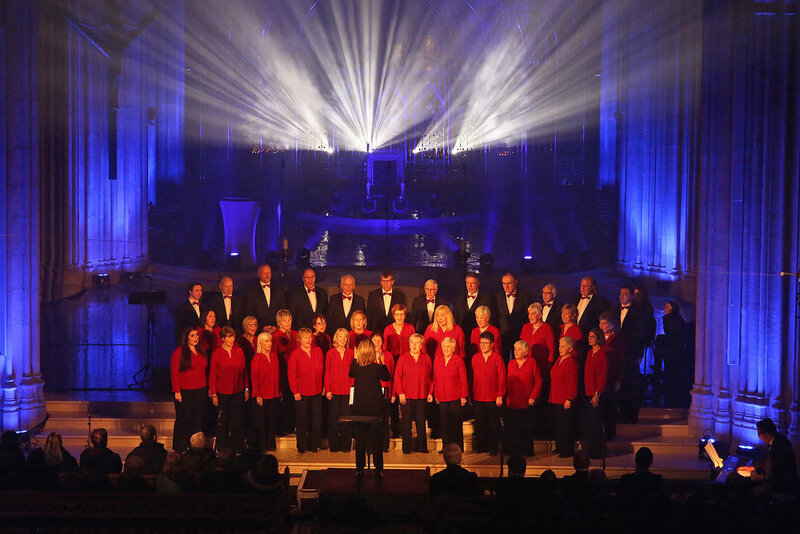 The Clare Chorale joined choirs from all over Ireland in a celebration of St Patrick in the magnificent setting of St Patrick’s cathedral in Armagh. 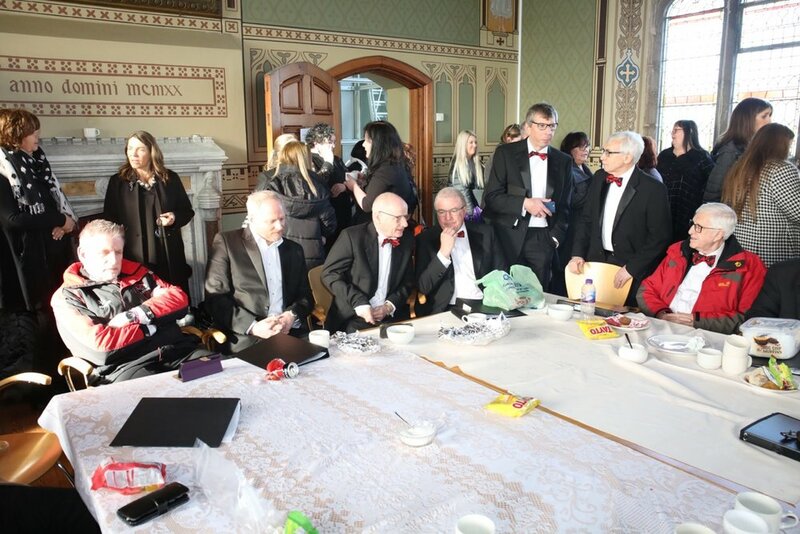 It was a wonderful evening of song, music and dance produced by John Anderson for a programme to be broadcast across Ireland on RTE and streamed across the world on the Internet. 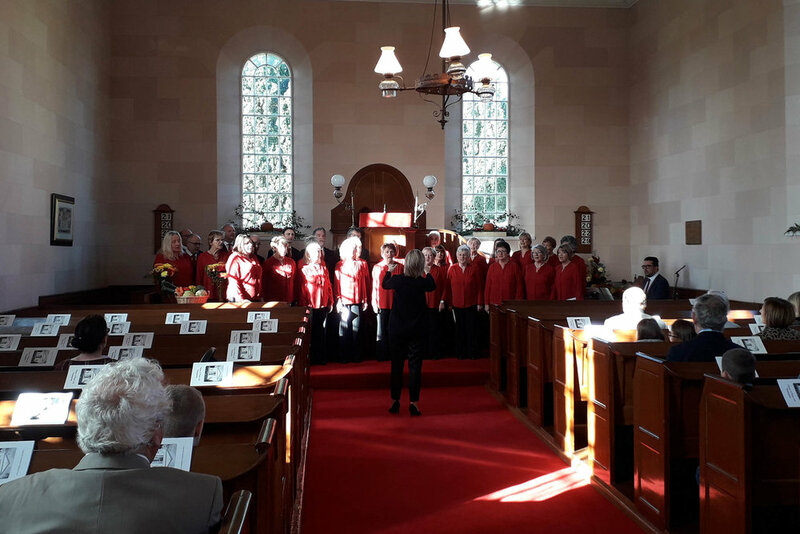 Other choirs taking part were the Armagh City Choir, the Drumcree Singers, Setanta, the Priory Singers, the Roscommon Solstice Choir, Allegri, Cahir to Sing (Tipperary), the Lynn Singers, Cavan Rugby Club Male Voice Choir, Whitehead Ladies Choir, Concentio and Grosvenor. 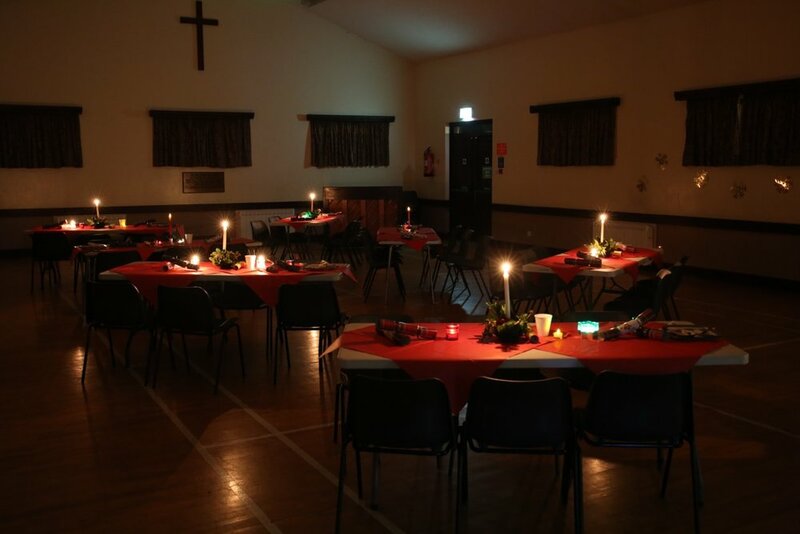 This year’s Christmas party had a different format as it was decided to have a very informal gathering in Kilbride Parish church hall. 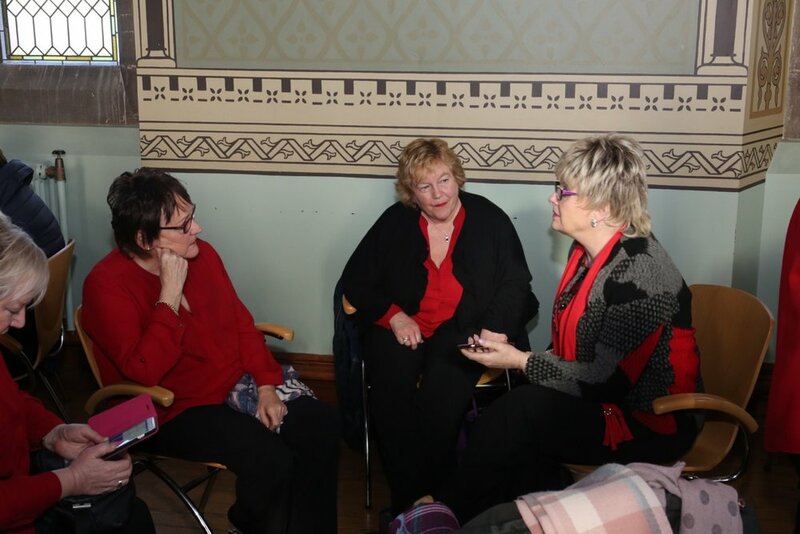 Some light refreshments were enjoyed right at the start and then the entertainment began. 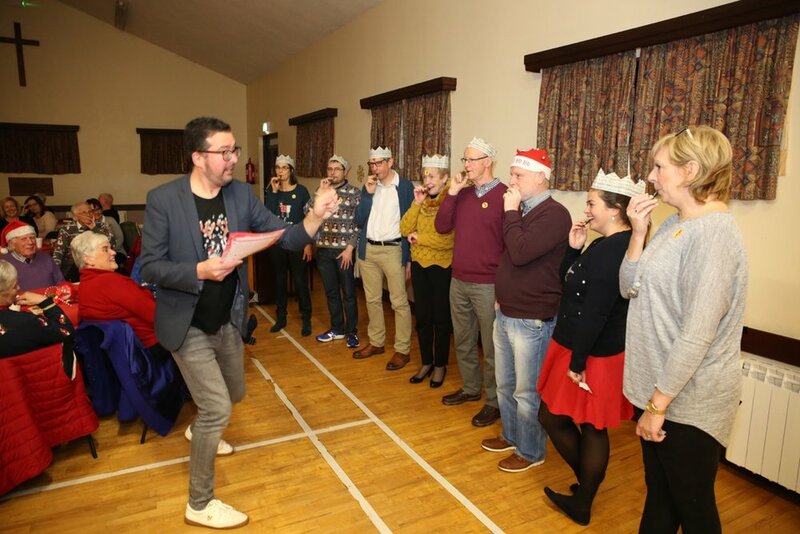 Darren led the way with a guess the tune session. 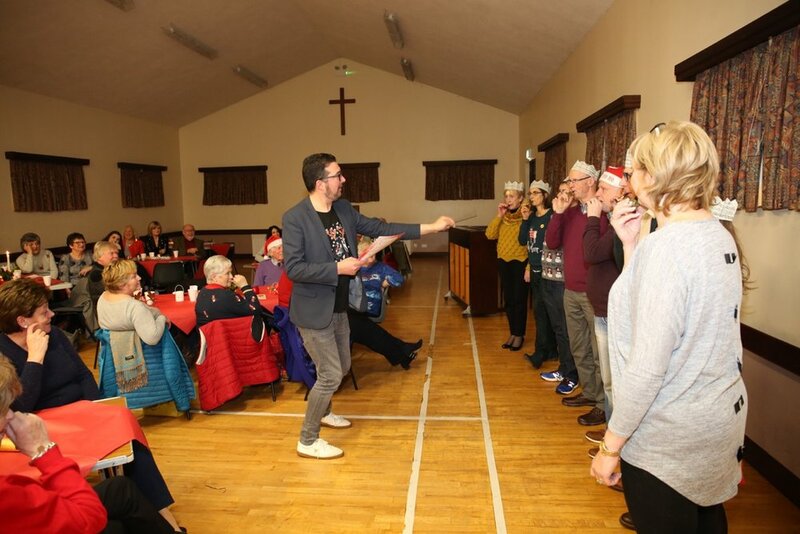 Inside one numbered Christmas cracker on each table was a whistle and one player from each table stuck the appropriate number on, took the whistle and joined seven other ‘whistle blowers’ taking instruction from Darren as he called out numbers representing notes of a well known tune. It proved a little difficult at first until it was realised that whistles or numbers had got mixed up giving the completely wrong notes. Once that was sorted out the music flowed but with some hilarious results. 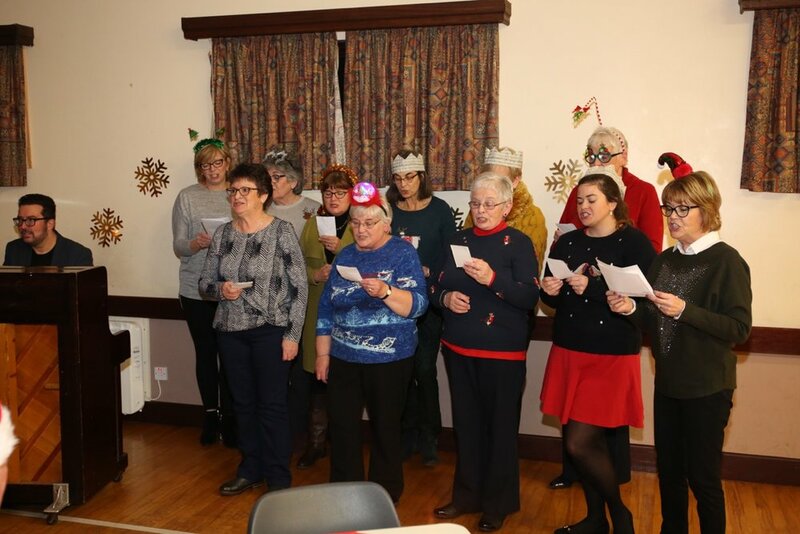 The alto section then stepped up and sang an hilarious song, penned by the ladies themselves to the tune of ‘Santa Claus is coming to town’, and all about our Musical Director. Next up was Mark Haffield who played two solos, firstly on an unusual Hawaiin instrument called a xaphoon and then on a violin. 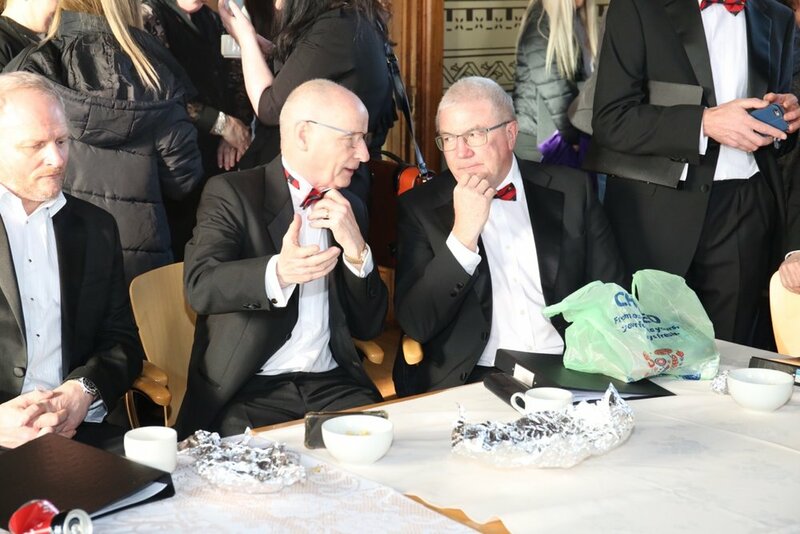 A choir guest, Hubert Greer, then sang one of his favourite Percy French songs called McBreen’s Heifer. Darren was then joined by two of his friends and collectively they call themselves the Tinkle Belles, in the lead-up to Christmas at any rate. 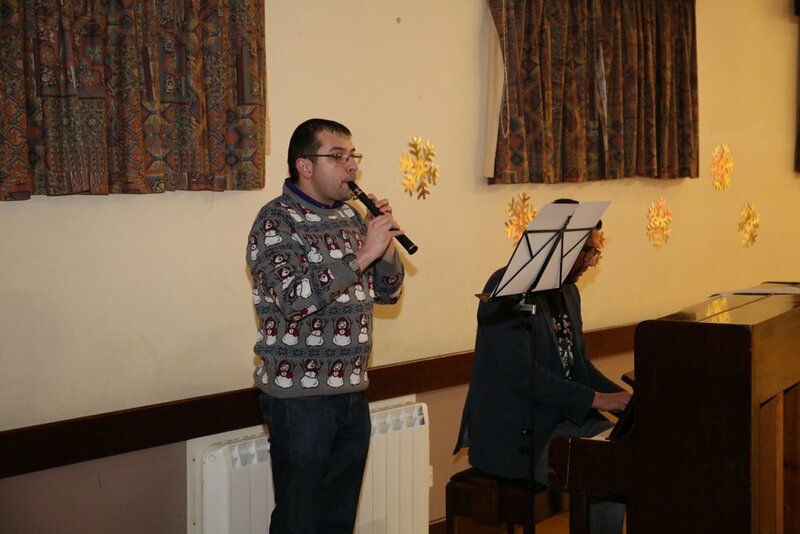 They really entertained everyone with a wonderful variety of songs from the shows as well as some sacred pieces. A thoroughly enjoyable evening was had by everyone and in a format that may well be repeated in the future.